Doesn't that look like a big bowl of sunshine?? When I first had to give up dairy breakfast was the meal I was most worried about. I mean without milk for cereal, yoghurt, cheese or even butter, what on earth was I going to eat?! But I needn't have worried. While I do miss yoghurt, there are good substitutions for everything else and it just takes a little creative thinking. I've been experimenting with different mueslis for breakfast for months now. I make a killer chocolate and chia muesli (recipe to come) but I wanted something a little lighter and fresher this time around, esecially now that the weather is starting to warm up. Orange and almond is one of those flavour combinations that just works, and there are lots of recipes for dairy and gluten free orange and almond cakes. I've made a great one myself (although it disappeared too quickly for me to get a photo!). The flavours work just as well as a muesli and when served with some sliced fresh fruit and a little cashew milk it makes a delicious, nutritious and really filling breakfast. Preheat the oven to 160 degrees celsius. Grease 2 large baking dishes and set aside. 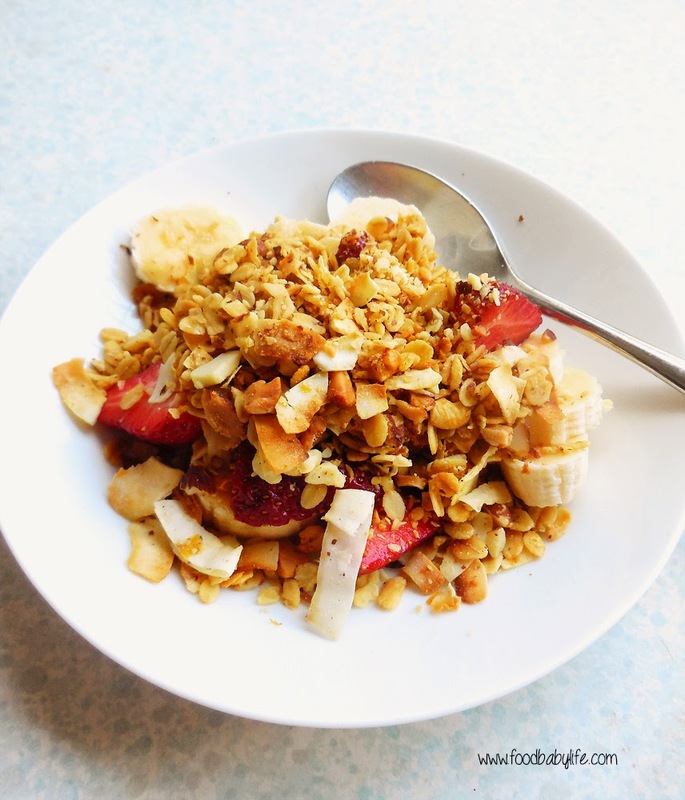 In a vary large bowl, mix together the oats, almonds, cinnamon and salt. Place the rice malt syrup, coconut oil, orange juice and orange zest in a small pan over medium heat and bring just to the boil. Pour over the dry ingredients and stir well to combine. Divide the mixture evenly between the 2 trays and bake for approx 45 minutes, stirring at least 3 times and rotating the trays so it browns evenly. I like mine quite toasty brown but keep an eye on it and remove it when it is as dark as you like. It will smell toasty and citrus-y but will still seem a bit damp - it will dry out as it cools. Remove from the oven and allow to cool completely before storing in an airtight container. It will stay fresh for a couple of weeks, or you can freeze it in batches and just bring out what you need for a few days.